Of course, there is a way to know. Of course, I'm stupid and don't pay attention. That's because there's an indicator on the car's dashboard thatwhere the fuel door is. I'm dumb. Every time I rent a car and pull up to the gas station, I just pray the fuel is on the driver's side because who in their right mind checks beforehand. Of course, there is a way to know. Of course, I'm stupid and don't pay attention. That's because there's an indicator on the car's dashboard that tells you where the fuel door is. But I usually have 10 minutes left before I've got to drop off the rental and it's a mad, mad dash before I get charged a ridiculous $30 for going over the hour. It's usually a stab in the dark 'cause I have a 50/50 shot of making the right guess. 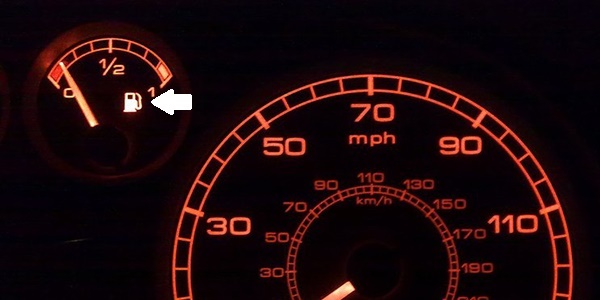 So where and what is this indicator? Well, it's on the fuel gauge. If you pay close attention -- which I apparently don't -- there is an arrow on it that will either point to the left or to the right. 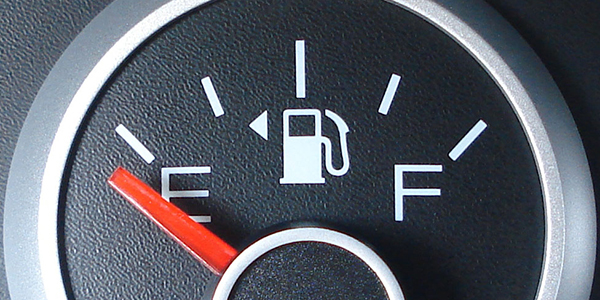 That arrow indicates which side the car's fuel door is on. In the lead photo above, that would mean it's on the left side, or on the driver's side if you're in America. In this photo, I've drawn an arrow to where you should look in the dashboard above. In fact, if you look more closely on the above photo, you'll notice there isn't an arrow at all. This illustrates another very important point: older models may not have this indicator. It's a good thing, then, car rentals tend to be newer models.